The ANS synthesizer was created by Evgeniey Murzin over a 20 year period, from 1937-1957. Only one copy of the instrument was made and still exists to this day. 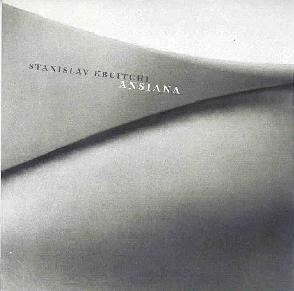 Russian musician Stanislav Kreitchi, a contemporary of Edward Artemiev, has been experimenting with the ANS since the early 1960s, and Ansiana was created using the ANS, keyboards, and a stringed instrument called an ovaloid, created by Viatcheslav Kolleychouck (who also plays ovaloid on a couple tracks). Much of the music on Ansiana has an INTENSE electronic chamber music feel. Kreitchi creates dark worlds of wailing tones, the sound of raking piano and other stringed sounds on the ovaloid, amidst a fascinating mix of orchestral and purely electronic sounds. Something like the Kronos Quartet gone space electronic. "Tryptich Ocean" and "Ansiana" are two of my favorite tracks. "Tryptich Ocean" is an aptly titled aquatic piece that places the listener on the beach, the ocean waves pummeling the shore. But the aliens are hovering overhead. Bleeping and shooting efx conjure up images of flying saucers and their musical dance. But things take an odd turn as tribal percussion is introduced, and now we see the aliens landed and dancing around the fire in communal harmony with the natives. Simultaneously eerie and trippy... and mucho freaky! The title track is an exploratory electro space freakout piece that bombards the listener with a banquet of bleeps, high pitched tones, and alien aircraft drones. A good fun track that takes us along with Kreitchi as he explores all the ANS' possibilities. "Ellipsiada (Parts 1 & 2)" is another highlight that begins softly with lightly clanging bells, playful raking across the ovaloid, and deep crying drones. This too has a chamber music feel, but is more experimental, utilizing all manner of sound to create avant-classical styled themes. There are some harsh, brain-piercing moments that made it difficult to listen with headphones, the world Kreitchi has created feeling like a desperate apocalyptic future. And the intensity goes sky high as he bangs, clangs, and bashes out a percussive symphony. A great track for exploring pure sound and frightening imagery. Also notable is "Six Days Of Creation", which features Anna Kolleychouck's voice fluttering rapidly from left speaker to right Laurie Anderson style, to the accompaniment of the ovaloid and tripped out spacescapes. In summary, Kreitchi's creative use of the ANS has produced an absorbing set that fans of both electronic space and avant garde classical music are sure to enjoy. Musicians and equipment freaks will be particularly interested in hearing the sounds produced by the ANS. Recommended.